Create professional interactive multimedia Windows applications with your graphics, music, video and other content... even if your only computer programming experience to date has involved an eight-pound hammer and a chainsaw. No knowledge of Windows or other nasty digital stuff is required. Interactive photograph albums — its Photo Album Wizard can create them in seconds. Digital portfolios that are way too cool to ignore. Electronic books and brochures — add formatted, scrollable paragraph text. Clickable catalogs. Paper catalogs can't talk — electronic catalogs can. Custom Windows applications — replace days of costly programming with a few clicks. Multimedia presentations that include music, sounds, video, animations and still graphics. ...and just about anything else you can think of that will fit in a window. 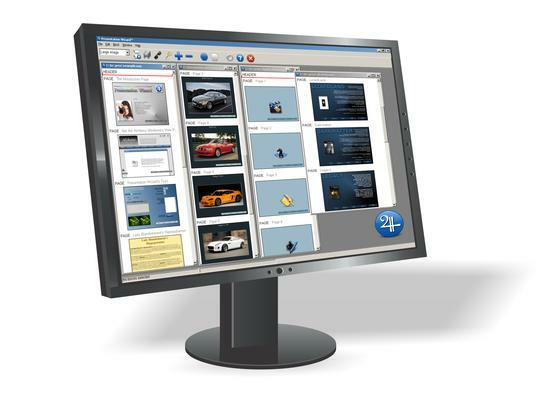 Unlike other presentation packages, Presentation Wizard's document files are entirely self-displaying. It creates Windows EXE application files which can subsequently be viewed without any additional software. Presentation Wizard's presentations can be e-mailed, downloaded from a web server, distributed on disk or CD-ROM and generally passed around without worrying about their eventual recipients having specific viewing software installed on their systems. Any computer running a current version of Windows will be able to open a Presentation Wizard document. Build quick electronic slide shows. Design electronic books that include pictures, sounds, video and interactive elements. Write your own clickable advertisements, to distribute alone or with other products. Assemble a distributable portfolio of your artwork. Include graphics, animations and text fetched from your web server in your presentations. Distribute your presentations with no viewers, run-times or DLLs to lose. A Presentation Wizard presentation can be thought of as being analogous to a very intuitive book. Each page of the book can include pictures, animations, video, sounds and Windows controls such as buttons and list boxes. The pages can turn themselves or wait for their users to click on Next. Unlike the pages of a traditional book, they can talk to their readers if you like. We suggest that you give the readers of your presentations a bit of warning should you have the pages you create talk unexpectedly — especially if some of them have weak hearts. Whether you'd like to be able to e-mail an electronic photograph album to your relatives, distribute advertisements with a shippable product, allow users of your web page to download a multimedia catalog, show prospective clients samples of your work or assemble books that would have sent Johannes Gutenberg screaming from his workshop, wondering desperately if wasn't too late to invent the paperclip instead, Presentation Wizard will transform your ideas into a complete, professional Windows application. IMPORTANT: Presentation Wizard requires access to the Internet to validate itself after installation. Please see the discussion of registration key security for a detailed discussion of this functionality. Click on one of the following links to download Presentation Wizard 9.0a revision 2. This file is 26,540,544 bytes in length. The downloadable installer for Presentation Wizard includes an example presentation that illustrates some of its coolest features. As of this writing, if you have previously registered or upgraded to Presentation Wizard 8, you can still upgrade to Presentation Wizard 9 for half price. We are able to provide some limited support for the version 8 software, but it's becoming increasingly vulnerable to changes in Windows and some third-party security products. Presentation Wizard 4, 5, 6 and 7 have reached their ends-of-life, and they have been removed from distribution. We no longer have replacement installers for these products. We are able to provide replacement registration keys and limited support for Presentation Wizard 7. We recommend that you register Presentation Wizard 9. Presentation Wizard 2 has reached its end-of-life, and it has been removed from distribution. We no longer have replacement registration keys or installers for this product, and support for it has ended. We recommend that you register Presentation Wizard 9. Please be sure to review the terms and conditions for distributing Presentation Wizard's documents. There's nothing particularly ominous therein, but the lawyers would have screamed loudly enough to have been heard in Patagonia if we hadn't included them. Presentation Wizard™ is a trademark of Alchemy Mindworks Corporation.